There is now a plaza at Penn Plaza. The finishing touches were added to a temporary pedestrian space occupying the full breadth of 33rd Street just west of Seventh Avenue earlier this week. 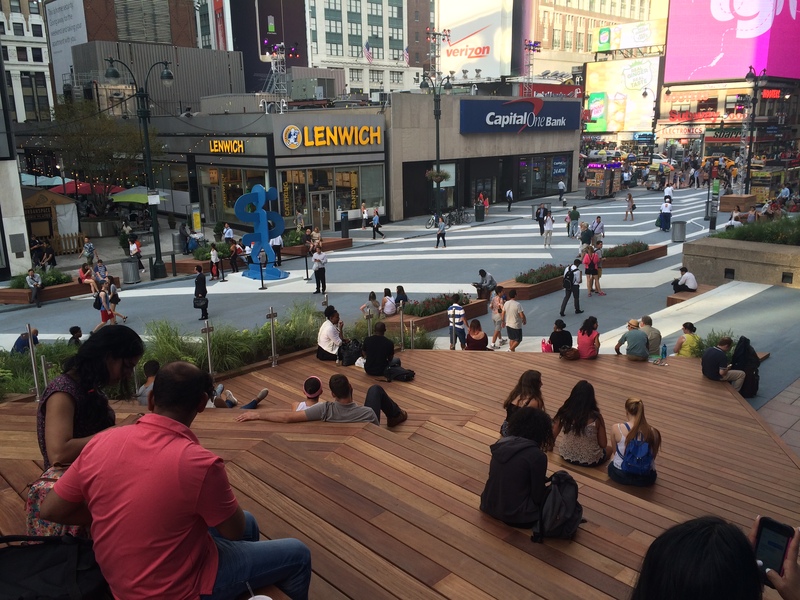 The plaza stretches a little less than halfway to Eighth Avenue, replacing what used to be westbound traffic lanes with planters, sculptures, a terraced seating area, and a painted surface to grab the attention of passing commuters. Vornado is planning to host performances, workshops and other events in the plaza space this summer and fall. For a temporary plaza, the design is high-quality, noted Curbed, including sculptures by Keith Haring and Roy Lichtenstein. 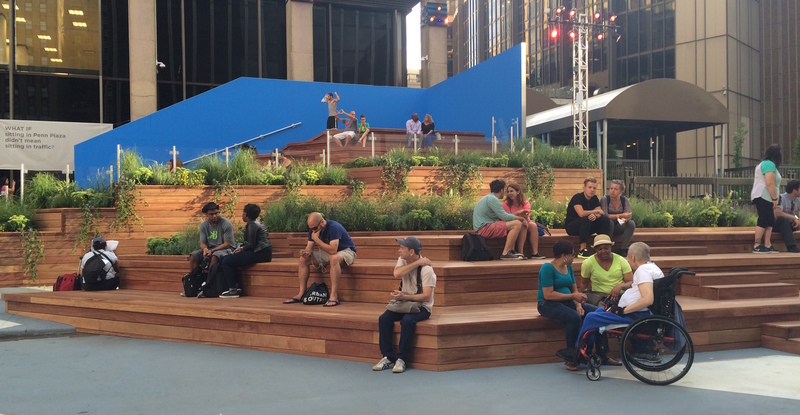 Some of the wooden seats are cleverly designed to fit over concrete steps, while the planters are ringed by seating, as well. The western half of the block was converted to two-way operation and is used by Madison Square Garden for access to its loading docks. While the plaza provides a low-stress connection to a Citi Bike station across Seventh Avenue, a Vornado security guard at the plaza yesterday said bicycling, along with skateboarding, is prohibited. The plaza is the centerpiece of changes Vornado recently installed nearby. A painted sidewalk extension, including benches and planters, was added to the north side of 32nd Street between Sixth and Seventh avenues. Vornado also worked with UrbanSpace to launch Penn Plates, a pop-up food market in Pearson Park, an outdoor mid-block passage connecting the plaza to 34th Street. The market is open daily from 11 a.m. to 9 p.m. through November 15. The plaza on 33rd Street and sidewalk extension on 32nd Street will be removed October 11, at which point Vornado and DOT will evaluate whether to make the plaza permanent or bring it back seasonally. Vornado has hired Sam Schwartz Engineering to monitor 10 nearby intersections during the trial period. The real estate giant has also hired Norwegian architecture firm Snøhetta, designer of the permanent Times Square plazas, to develop a public space plan for its properties near Penn Station. Pedestrian volumes on streets near Penn Station are among the highest in the city. In 2008, Tri-State Transportation Campaign launched a campaign, Penn for Peds, to give more space to pedestrians near the station. In 2010, DOT unveiled a plan to construct a transitway on 34th Street that included a one-block plaza between Fifth Avenue and Sixth Avenue. The plan was withdrawn in 2011 due to opposition from nearby property owners. This is a fantastic project. Seems, though, like they should have added some bicycle facilities to the mix, since 33rd street is one of the few crosstown streets where bicycles can go all the way across but cars are forced to turn, creating a de facto Bicycle Boulevard. Maybe DOT could actually put some time into creating crosstown connections, instead of striping double parking lanes and sharrows and calling it a day. I love that she tells you she commutes from “Flushing Estates.” Google isn’t even sure where in Flushing that may be. Last time I was there there were plenty of monitors inside visible from seats repeating security warnings about how to behave around the bomb-sniffing dogs. And few good places to sit and see train arrivals/departures. Priorities seem really screwed up there. They’re not designed very well, but the LIRR “TrainTime” and NJTransit “DepartureVision” apps/mobile sites show track assignments (and NJT even includes Amtrak trains). You could sit out there and refresh ’em on your phone. I’ve actually used that while in Penn so I wouldn’t have to stand around the monitors with the thousand other zombie commuters. Yes I use that app, but at the end of a long day the phone might be out of juice. Plaza design is by W Architecture and Landscape Architecture. 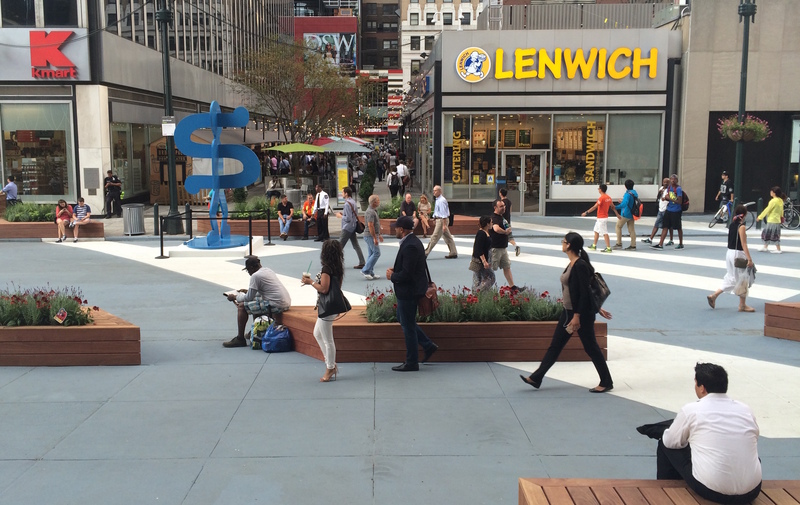 Eyes on the Street: 33rd Street Plaza Gone… Til Next Year?